Media stories on community efforts to save roadside vegetation. VicRoads continues to demolish large old trees despite admitting already being well over permitted numbers. 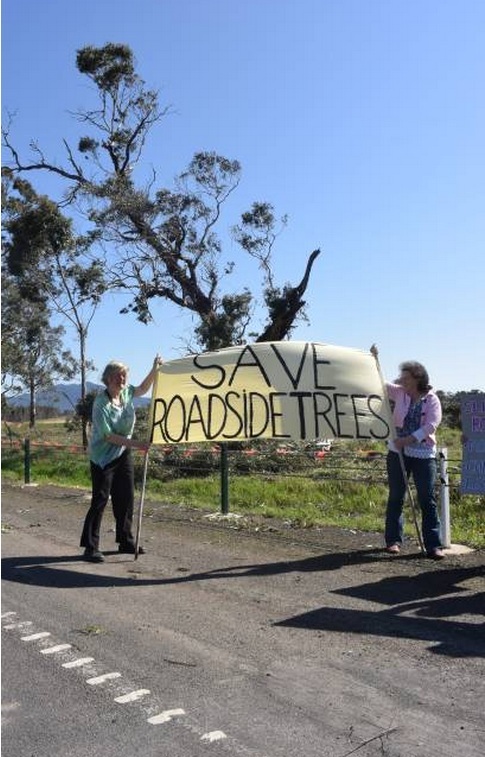 WHAM supporters gathered at Buangor on the Western Highway on 14th Sept to protest continuing destruction of significant roadside trees – mainly redgums. VicRoads had issued a media release, falsely claiming only “4 large old trees in a group will be removed.” WHAM had already measured 70 of the 140 trees, so by extrapolation was able to present more accurate numbers: a total of ~48 large and very large trees, not 4 as stated. (The categories are those used in VicRoads’ own EES, and refer to trees over ~ 250 years old). Downplaying tree removal numbers is typical of VicRoads’ approach to the whole project. They have learnt nothing from the “nine hundred giant native trees felled” blunder as described in the Age article (see next post). A piece from The Age on the massive destruction of significant old red gums for the upgrade of the Western Highway. Journalist: Adam Carey. “A planning blunder has led to the destruction of almost 900 towering old native trees after VicRoads severely underestimated the environmental impact of a highway project it is managing”. Rushworth residents woke early one morning to discover contractors getting out their chainsaws and preparing to cut down more than 120 mature, endangered trees. Quick action by locals stopped cutting that day and a huge campaign began. WHAM talks on 3CR – Community Radio. See the “Dirt Radio” program where Friends of the Earth campaigners and activists dig down into the dirt on important environmental and social justice issues. Monday 10:30am to 11:00am. Listen to the “latest episode” to hear the WHAM interview. 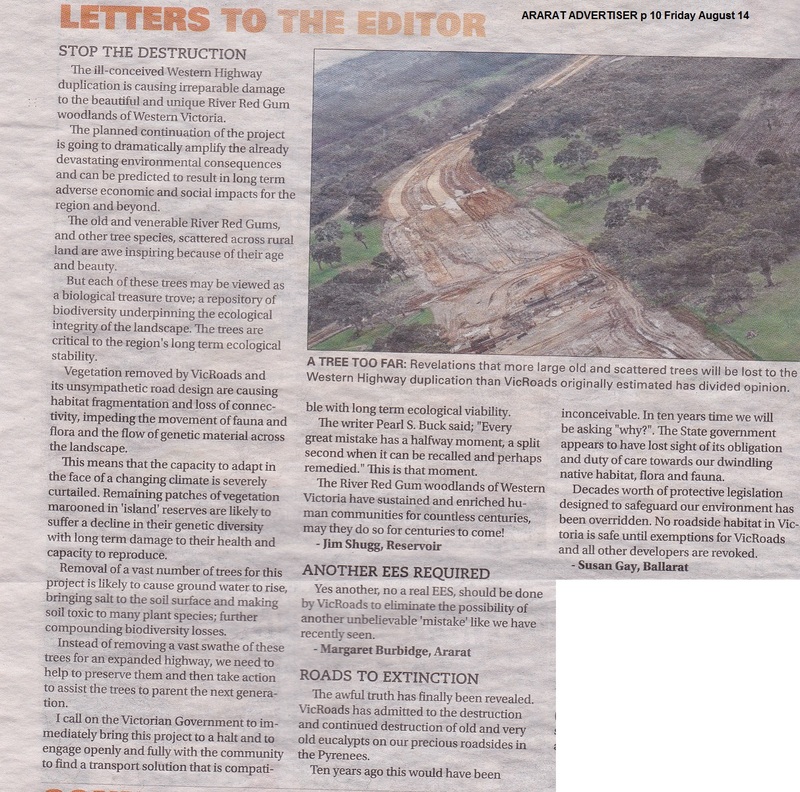 Trenchant letters to the editor express disgust at an extra 900 large old trees VicRoads didn’t mention. Must read – fabulous letters by Jim Shugg (Reservoir), Margaret Burbidge (Ararat) and Sue Gay (Ballarat).Congrats to those fine writers. The ill-conceived Western Highway duplication is causing irreparable damage to the beautiful and unique River Red Gum woodlands of Western Victoria. The planned continuation of the project is going to dramatically amplify the already devastating environmental consequences and can be predicted to result in long tern adverse economic and social impacts for the region and beyond. The old and venerable River Red Bums, and other tree species, scattered across rural land are awe inspiring because of their age and beauty. But each of these trees may be viewed as a biological treasure trove; a repository of biodiversity underpinning the ecological integrity of the landscape. The trees are critical to the region’s long term ecological stability. Vegetation removed by VicRoads and its unsympathetic road design are causing habitat fragmentation and loss of connectivity, impeding the movement of fauna and flora and the flow of genetic material across the landscape. This means that the capacity to adapt in the face of a changing climate is severely curtailed. Remaining patches of vegetation marooned in “island” reserves are likely to suffer a decline in their genetic diversity with long term damage to their health and capacity to reproduce. Removal of a vast number of trees for this project is likely to cause ground water to rise, bringing salt to the soil surface and making soil toxic to many plant species; further compounding biodiversity losses. Instead of removing a vast swathe of these trees for an expanded highway, we need to help to preserve them and then take action to assist the trees to parent the next generation. I call on the Victorian Government to immediately bring this project to a halt and to engage openly and fully with the community to find a transport solution that is compatible with long term ecological viability. The writer Pearl S. Buck said: “Every great mistake has a halfway moment, a split second when it can be recalled and perhaps remedied.” This is that moment. The River Red Gum woodlands of western Victoria have sustained and enriched human communities for countless centuries, may they do so for centuries to come! The awful truth has finally been revealed. 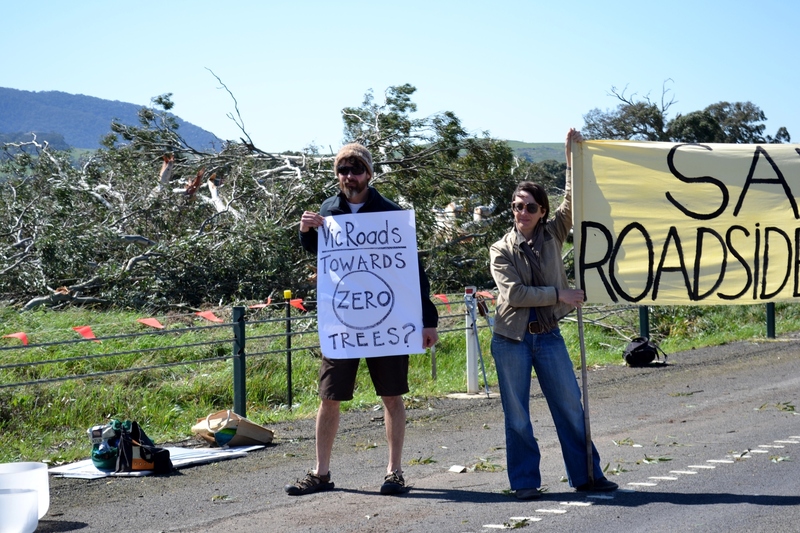 VicRoads has admitted to the destruction and continued destruction of over 1000 old and very old eucalypts on our precious roadsides in the Pyrenees. Ten years ago this would have been inconceivable. In ten years’ time we will be asking “Why?” The State government appears to have lost sight of its obligation and duty of care towards our dwindling native habitat, flora and fauna. Decades worth of protective legislation designed to safeguard our environment has been overridden. No roadside habitat in Victoria is safe until exemptions for VicRoads and all other developers are revoked.